Its hard to stop the spam or a fake news, but Facebook owned instant messaging service, WhatsApp is continuously working on protection of its users from spam, or malicious links. For this Whatsapp is testing a new spam prevention feature which is being called as the ‘Suspicious Link Detection’. According to the WABeta, this Suspicious Link Detection features is available on beta version of WhatsApp 2.18.204. With this feature, users come to know that the following link that they received is suspicious or not, before clicking on it. At the mean time, on Playstore Whatsapp beta version 2.18.206 is available however, the application did not receive the functionality as the feature is still under testing and will take some time for the company to roll out. Users who were expecting the new feature on their phones should not worry since WhatsApp has made it clear that it is still working on the function and it is in the development stages. 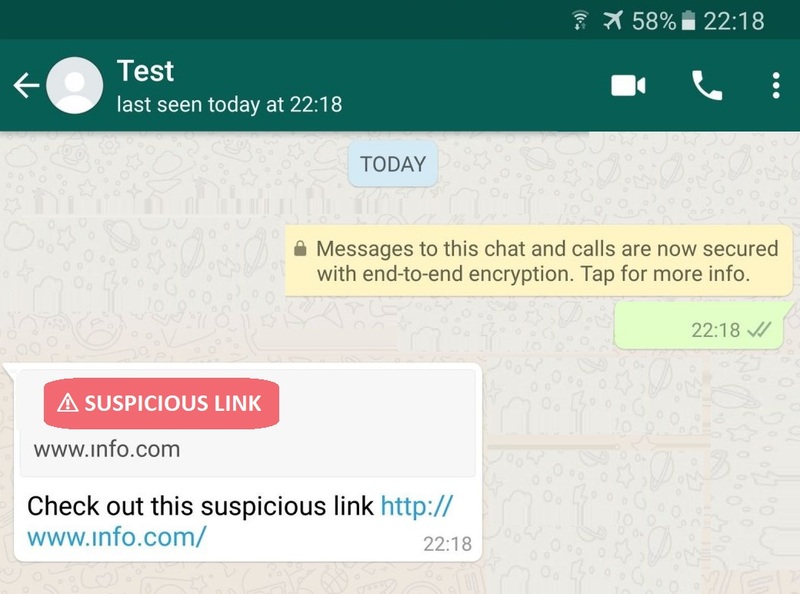 The new Suspicious Link Detection feature will scan the link locally for any spam, and if the link contains any suspicious characters or if WhatsApp thinks that it will redirect to somewhere unsafe, it will flag the link as suspicious by displaying a red warning sign over the message. Even after the warning sign users click on the flagged link, then WhatsApp shows them a confirmation message asking them if they are sure about visiting the site. As WhatsApp says that users privacy is their first concerns, this spam link detection feature will be another big thing that is coming to WhatsApp.